Last Saturday, Rosemary, our daughter Hilary and Hilary’s younger daughter Lauren, 11, and I watched King Solomon’s Mines after dinner. I make it a point to select a film for us to watch that will please everybody. In many cases I have seen the films before and usually I had seen them as a boy. As a man of 71 I can laughingly comment that I would surely dump my wife of 45 years for Deborah Kerr (or Charlotte Rampling or Molly Parker). Rosemary smiles but does not know how serious I am really. My eldest granddaughter Rebecca is shocked and said so that I would opt for a dead woman (Kerr) over my very much alive wife. I have no idea if Rosemary thinks the same (would she dump me for the handsome dead star?) about the other star of King Solomon’s Mines, Stewart Granger. But what is important is that it is human to dream, to imagine and associate. 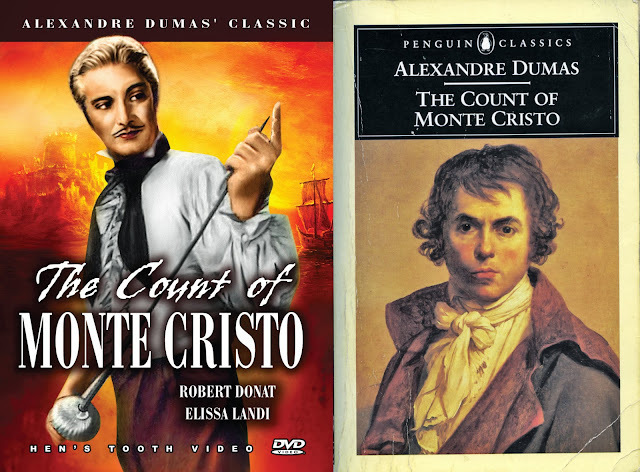 For today I took out the 1934 version of Alexandre Dumas's The Count of Montecristo, directed by Rowland V. Lee and with Robert Donat and Elissa Landi. My reason for picking these films is that I remember them as the films of my boyhood. Life was simple. You went to school, you ate and you went to the movies. There were only five classifications for movies worth seeing, they were conboys (Argentine Spanish), de guerra (war), espadachines (sword fighters but especially with fencing foils), piratas and that exclusive classification, Tarzán. I had read 13 of Andrea Camilleri’s novels featuring Salvo Montalbano, a comisario of police in Sicily before I first saw the wonderful Italian TV series Montalbano with Luca Singaretti as the sensitive man who likes to eat and swim. For many of us who read novels before seeing films the often-made argument is if the actor or actress fits our idea of the protagonist of the novel. For many Basil Rathbone was and is Sherlock Holmes. For John le Carré we know that after having seen Alec Guinness play George Smiley in Tinker Tailor Soldier Spy in the TV series, somehow the man, Guinness had taken his character, Smiley out of his head and that he, le Carré would henceforth have a hard time writing about that protagonist. Few today would ever read To Kill a Mockingbird and not imagine Atticus Finch not being Gregory Peck. But in spite of the reality of a film and its actors supplanting the imagination of the characters of a novel I see imagination still with us and important. Earlier today, Lauren was playing in the living room. She was putting her fingers in the soil of my potted plants. I asked her what she was doing. Her reply startled me, “I don’t know what I am doing,” and she grinned as she told me. I realized that somehow I had broken a game of her imagination. When Rebecca was 8 I proposed to my friend, Argentine painter Juan Manuel Sánchez that he teach her to draw and paint. At the time Rebecca was just three blocks away. I found it practical that Rebecca would learn art from a master while conversing in Spanish. Sánchez was adamant that this was not a good idea. He explained that a child until 11 or 12 had to be left alone to play with their imagination. They had to be left alone so that they could draw loosely without any restraints of an imposed style. It seems we had to be careful not to destroy that world/life of the imagination by asking precise questions as to content and meaning. We watched The Count of Montecristo. Lauren had seen a more modern version of it but was still transfixed, glued to all the activity on our Sony Trinitron TV set with its former cutting edge cathode ray tube. The whole evening cemented my acute realization on how important a child’s imagination is. And of course part of that is a child’s willingness to read books without pictures where the child has to imagine faces and places. Overhead obscurity was gone. From horizon to horizon the sky was an unbroken spread of stars. Two planets stared unwinking. The more obtrusive of the constellations asserted their individuality. Orion’s four-square shoulders and feet, his belt and sword, the Plough, the zigzag of Cassiopeia, the intimate Pleiades, all were duly patterned on the dark. The Milky Way, a vague hoop of light, spanned the sky. Imagination completed what mere sight could not achieve. Looking down I seemed to see through a transparent planet, through heather and solid rock, through the buried grave-yards of vanished species, down through the molten flow of basalt, and on into the Earth’s core of iron; then on again, still seemingly downwards, through the southern strata to the southern ocean and lands, past the roots of gum trees and the feet of the inverted antipodeans, through their blue, sun-pierced awning of day, and out into the eternal night, where sun and stars are together. For there, dizzyingly far below me, like fishes in the depth of a lake, lay the nether constellations. The two domes of the sky were fused into one hollow sphere, star-peopled, black, even beside the blinding sun. The young moon was a curve of incandescent wire. The completed hoop of the Milky Way encircled the universe. And from there he soars out of his body to explore space. Stapledon published Star Maker in 1937 and is a work that is purely of the imagination. Coincidentally tonight, in bed reading the Sunday NY Times that is delivered Saturday night I found in the Sunday Review a column by conservative Ross Douthat, who in spite of being a conservative is someone I admire and read. The column called Puddleglum and The Savage points out that on November 22, the date of John Kennedy’s assassination (the presidential motorcade was leaving Love Field), C.S. Lewis collapsed in his Oxford bedroom. And when a TV in the next room announced Kennedy’s death Aldous Huxley requested a final shot of LSD. As I read the above I understood the role of old-style films with few or elaborate special effects. I understand the importance of convincing, pushing, coaxing a young person to read. By doing so it will be a while before an Alec Guinness or a Luca Singaretti can replace that imagined person into the flesh and bone of the actor playing him. We enjoyed The Count of Montecristo. I did not tell my family that my image of the count had for some years been the face on the cover of my Penguin Classic - Portrait of an Artist by Jacques-Louis David and that Robert Donat seemed too pretty and too good to play the vengeful man. After all The Count of Montecristo features: literature’s most famous case of an implacable and most un-Christian revenge. It features a female serial poisoner, two cases of infanticide, a stabbing and three suicides, an extended scene of torture and execution, drug-induced sexual fantasies, illegitimacy, transvestism and lesbianism, a display of the author’s classical history, the customs and diets of the Italians, the effects of hashish and all in about 1000 pages. Alas they and the Vancouver Public Library do not have The Corsican Brothers with Douglas Fairbanks Jr. or The Crimson Pirate with Burt Lancaster. Next Saturday's film will have to be another.